Let us take you further. Our patients experience the Horse as the catalyst to achieve physical, emotional, and psychological improvement. Done in a Barn and Farm type setting, our patients experience improvements in a fun, friendly, and comfortable environment setting. What is hippotherapy (or equine therapy)? From the start, it should be understood that hippotherapy is not a separate form of therapy. It is physical, occupational, or speech therapy just as you’d find it in its conventional form. The only major difference is that the primary treatment tool of choice is the horse. Just as in a clinic the therapist may utilize any number of tools—bolsters, exercise machines, balance beams, gait trainers, ball pits, etc.—in hippotherapy it is the horse that is most typically called upon. That is not to say that other strategies and interventions are ignored. They are used in the same way as they always were, with the horse being an integrated component rather than a separate strategy in itself. In fact, depending on the purpose of the treatment and the desired outcome much of the session may be done off the horse, incorporating just such things as bolsters, balance beams, mat stretching, etc. And just as in ‘conventional’ therapy a component of treatment will involve home exercise instruction and caregiver education to ensure proper follow-through and carryover. Equine therapy works for a number of reasons. First and foremost, the issues of comfort and motivation are rendered all but obsolete. Where, in the clinic, much of the session may be spent trying to make the patient feel at ease or finding something that will motivate them, in the hippo setting these things are inherent. For riders of any age, being on or around a horse is exciting and cool, and the outdoor/farm atmosphere is engaging and fun, particularly when compared to a ‘typical’ clinic. What makes the horse such a wonderful treatment tool? The fundamental answer to this question is its unique movement. By imparting a simultaneous three-dimensional force to the rider’s hips that almost directly simulates human gait, it is forcing the rider to strengthen in a functional manner. What that means is that while the rider is maintaining his or her balance over the horse their body is gaining strength in all those muscles, large and small, that are responsible for keeping them stable and balanced—what can also be called “core strength.” And the fact that the movement is repetitive, rhythmic, and consistent allows the body to develop new and lasting pathways that translate into functional abilities such as walking, running, jumping, and playing. From a sensory standpoint, the horse provides a multitude of benefits. Whether it be through mounted riding, grooming, tacking or other hands-on activities, all the senses are simultaneously engaged and stimulated. During mounted riding, the rider is receiving a significant amount of input, not just from the physical connection but from a visual (the passing of landscape and trees) and vestibular (feeling the head moving in space) regard as well. And depending on variables introduced (e.g. shaving cream, paint, colored chalk) and positional changes (forward facing, side sitting, etc.) these can be ramped up or down to match the needs of the rider. Absolutely. When performed under the proper supervision of trained professionals and in accordance with the standards and practices set forth by such governing bodies as PATH (Professional Association of Therapeutic Horsemanship) and the AHA (American Hippotherapy Assoc. ), equine therapy is very safe. No matter the diagnosis, if the impairments involve issues with strength, balance, tone, postural awareness, coordination, midline orientation, sensory integration, or range of motion, they can be addressed and addressed successfully. 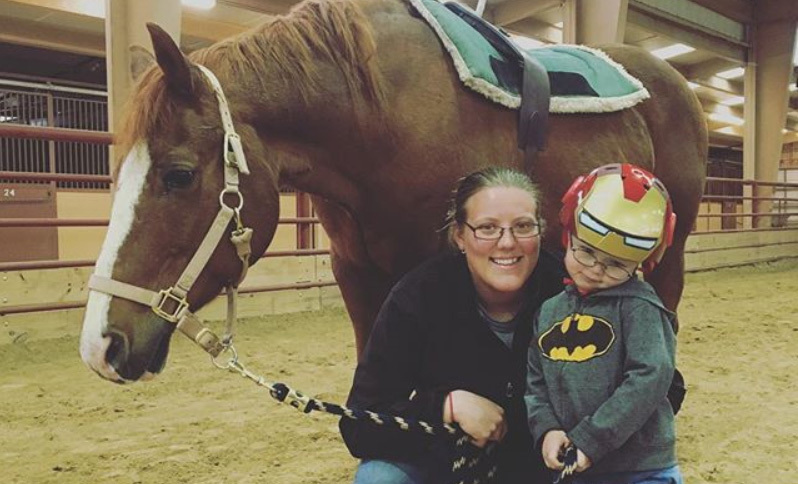 Our horses help those with cerebral palsy, Down syndrome, autism-spectrum patients, multiple sclerosis, developmental delay, post stroke, or TBI, just to name a few. There are some special considerations and contraindications to take into account, but for the most part every rider’s candidacy is considered individually. And as with every other treatment, hippotherapy should only be undertaken following extended discussions with the rider’s medical team, including physicians, therapists and caregivers. To initiate your participation in our program go to the Atlanta registration page, and follow the instructions there exactly. Once we’ve received your application and determined you to be a candidate, we will send you a full introductory packet to be filled out and signed. As soon as we receive that along with a copy of your of your prescription (reading “PT, OT, or SLP,” Evaluate and Treat) and a copy of your insurance card(s), front and back, an initial visit date will be set and you will be sent an email invoice for the first seven (7) sessions. Payment can be completed online either through credit card or PayPal, including FSA and HSA accounts. Once the payment AND Introductory Packet are received your chosen spot will be secured for the upcoming session. Fees break down to $195 per hour session, and are due up front prior to the initial session. This covers all therapist fees and associated barn fees, etc. For insurance reimbursed riders My Heroes will receive the standard reimbursement rates depending on the payer’s plan and any subsequent balance will be credited toward future sessions or sent directly back to you. Is hippotherapy covered by insurance? As alluded to above, hippotherapy is not a separate treatment strategy. It is billed just as any outpatient PT, OT, or SLP, using traditional coding in alignment with the desired goals. As such, your coverage in our program will depend on your insurance’s typical coverage of outpatient therapy based on your plan. While we do not guarantee reimbursement we will submit all claims and do everything we can to provide your insurance company with any and all records they may need. Currently, My Heroes does NOT accept Medicaid, Medicare, Peachcare, or any other state run insurance, though we receive regular reimbursement from all major insurance carriers are considered Out Of Network, based on individual plans (this may be changing soon for BCBS). A session lasts one hour, and will be broken down depending on what goals are trying to be achieved. This could mean anywhere from ten minutes of mounted horse time to forty minutes of mounted horse time, with the remainder taking place off the horse in the form of grooming, tacking, home exercise education, or any other standard exercises or measurement gathering. Typically these sessions occur once per week and are always scheduled for the same time every week (e.g. 10 AM on Thursdays). What is the appropriate attire for myself/my child to wear? 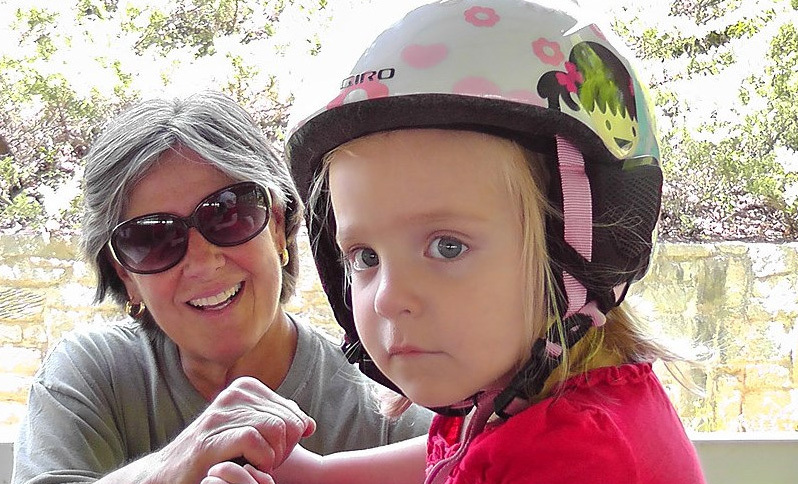 What is the difference between hippotherapy and therapeutic riding? 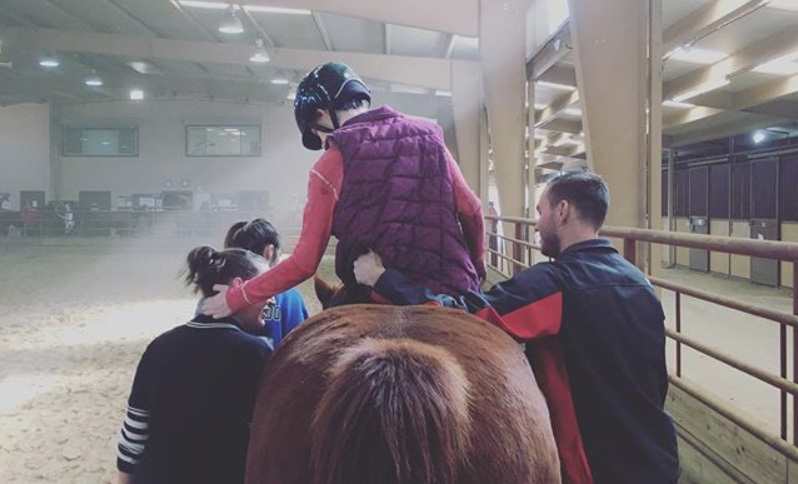 While both hippotherapy and therapeutic riding can look similar from the outside there are some very fundamental differences between the two. Hippotherapy is an equine therapy session run under the control of a state licensed therapist. The horse is being treated as a tool but the intention is not to improve horsemanship or learn the skills of horseback riding. Achieving functional, physical and sensory goals is the key, just as it is with outpatient therapy. In therapeutic riding the instructor is certified through PATH but the sessions, while geared toward special needs riders, are considered recreational in nature. It is more about learning the skill of horseback riding and improving weekly at that skill. Some of the benefits cross over, to be sure, such as balance, coordination and strength, which makes it an ideal transition once hippotherapy goals have been achieved. Depending on the level of involvement of the candidate, a therapist may recommend this option following their initial evaluation and assessment. What if I or my child have to miss a treatment? At the beginning of each session you will have an opportunity to account for any planned absences and you will not be billed for those treatments. We also understand that given the amount of issues our parents/riders have to deal with on a day to day basis, there may be no warning for a last minute cancellation. With that in mind, we will do our best to provide a make-up for the missed session if the need arises. If no make-up is available a credit will be counted toward the next trimester session.